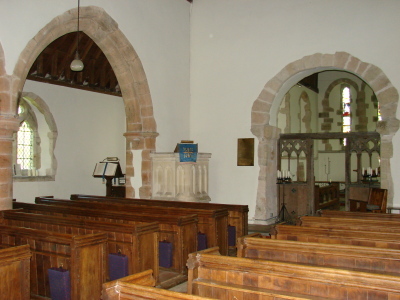 The chancel arch and possibly some walling in the nave are late C11 and the rest is C13, with aisles, tower and chancel. The C19 restoration was by G E Street. 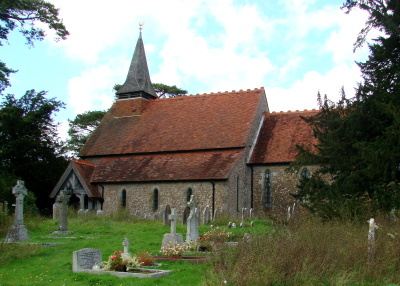 The church is on the northern edge of the loosely grouped village, some way from the Roman villa that is Bignor’s main claim to fame. The plain, round-headed chancel arch is C11. It lacks through-stones, but has square responds and deep, chamfered abaci. Together with its relatively broad proportions, these make a pre-Conquest date unlikely, though Taylor and Taylor note the lack of any distinctive feature (p715). It is probably of much the same period as Domesday Book (11, 78), which mentions a church. The nave is likely to be of similar date, for it is strikingly broad for the late C11, let alone the pre-Conquest period. Indeed, the unusually long stretches of wall at each end of both arcades suggest that the arcades could have been inserted in the original walling. The church is otherwise mostly C13. The two-bay nave arcades may not have been built simultaneously, for the piers are not quite opposite each other and the stone of the slightly later north arcade is darker. Both have double chamfered heads and round piers, but the mouldings of the capital on the north pier are deeper and more complex and the two orders of the heads are better proportioned. The base of the south pier is spurred, showing it to be early C13. The responds also differ; on the south ones the inner orders of the arches rest on shafts and the chamfers have curling stops. To the north, there are corbels and the chamfers have no stops. The south aisle is not in its original state for Adelaide Tracy (1849) shows it narrower than the present one, though as today it did not extend to the west end. She also shows a break in the roof-line as today, which is too small for a clerestory. The north aisle retains most of its C13 walling, with renewed east and west lancets and a plain chamfered doorway. 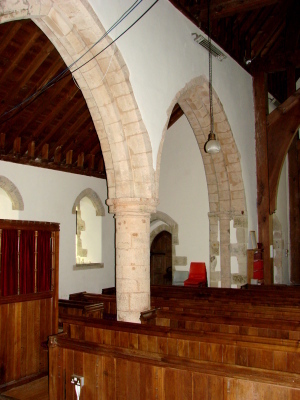 It too is narrow and ends short of the west end, but the roof continues the line of the nave. 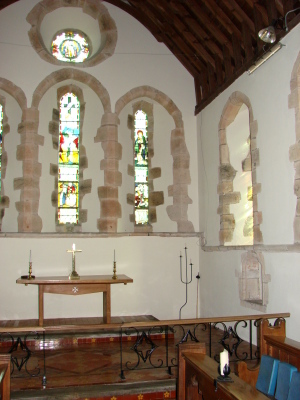 The C13 chancel, long in proportion to the nave, has tall lancets, three on each side and to the east. The taller centre east one is less accentuated than usual, to allow for a circular opening above. The westernmost lancets each side have low sills, but are not true lowsides as they are as tall as the others. Inside, a string-course links the sills, changing height as necessary. Though simple, the proportions are satisfying. 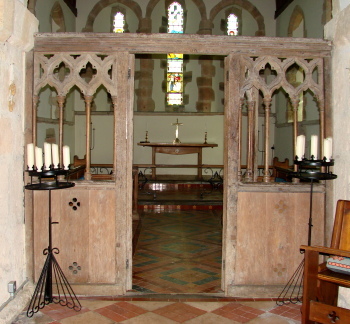 The small chancel arch, filled by a screen (see below), accentuates the division into two parts and gives an idea of how smaller village churches must have been when built. The only later change is a two-light ogee-quatrefoil north window of c1330 in the north aisle. After the Reformation the chancel fell into disrepair and in 1743 there was a proposal to reduce its height by two feet (Clarke papers), though there is no sign that this was done. Restoration was actively considered in the later 1870s. H Woodyer made plans for enlargement (Elliott and Pritchard p236), but it was G E Street who restored the church in 1876-78 (CDK 1878 pt 2 p71), making the significant changes to the exterior already noted. He rebuilt the south aisle wider with lancets and re-set the plain pointed C13 south doorway within a new open timber porch. On the north side, he heightened the aisle by two courses and renewed the east and west lancets. If, as has been said (ibid), he rebuilt the chancel, he did so remarkably skilfully. He reconstructed the belfry on four braced posts and replaced the roofs. In place of the pyramid cap shown by Adelaide Tracy, he added a shingled broach spirelet. He must also have designed the three-light west window in C14 style – the form of its predecessor is not known. Aumbry: (North chancel) Large and square-headed. Chest: (Formerly by chancel arch) Fine example of c1400 with an arcaded front and sides and a top with castellated decoration. It was at one time used as an altar (Mosse (ed) p7). Font: Plain C11 tub-shaped, mounted on a later base. Glass: (East window and chancel sides) C E Kempe, 1883. Piscina: (South chancel) C13 roll-moulded with what is in effect a segmental head, which was apparently cusped originally, giving a rather curious appearance. Screen: Mid-C14, though only the frame and the tops of the openings, consisting of cusped roundels, are original. It resembles the one at West Thorney, though that has more elaborate decoration.